Contrary to claims by some, there is no overall best auto pilot. I think all of the major brands are good, and your choice should be predicated by the characteristics of your particular vessel. The type of boat, existing or future navigation systems, accessibility and layout of the steering systems drives the best auto pilot system decision for your particular vessel. For discussions sake, we are building our auto pilot system around a hydraulically steered twin engine trawler. All of the systems use the same basic building blocks. There are control heads for the helms, a course computer, a rudder drive system such as a hydraulic pump, compass, and a rudder reference. It should be noted that newer systems for many boats no longer require a rudder reference, but more on that later. The very first thing top do is to go to the helm, and look at the existing navigation system. If this is a new boat, decide what vendor you want to use for navigation electronics first. The Installer's rule one: If you have an existing integrated nav system you are happy with, then buy that manufacturers autopilot. Why? Because the manufacturers have gone to extra lengths to provide special integration features for their own product lines. The Installer's rule two: Know thy steering cylinder ram. This is important for a couple of reasons. The first is that many hydraulic drive pumps are sized by the fluid displacement of the steering cylinder. So you gotta know. This requires accessing the lazarette if you have one, or ripping apart nicely made up aft cabin bunks, and the last option is climbing through the equipment jungle gym called an engine room to get to the steering gear. You need to know the hydraulic displacement of the cylinder. This is usually on the cylinder's label. If not get the part number and call the manufacturer. While you're there, check out the layout and see if you have a balanced cylinder, or if your cylinder is unbalanced. Most vessels, but not all will have a balanced cylinder. Translated this means the chromed pusher rod thingy pokes out both ends of the cylinder like you see in the picture above. The unbalanced cylinder's push rod only pokes out on one end. if this is the case, don't despair, just call the autopilot manufacturer. In all cases there is a solution available, and usually it's a simple one. Just don't let your unbalanced unit run around the boat with sharp objects. Only a couple of building blocks left to go, and one of them is the rudder reference. Lots of newer auto pilot system used on faster vessels don't require a rudder reference, and use a virtual rudder reference. 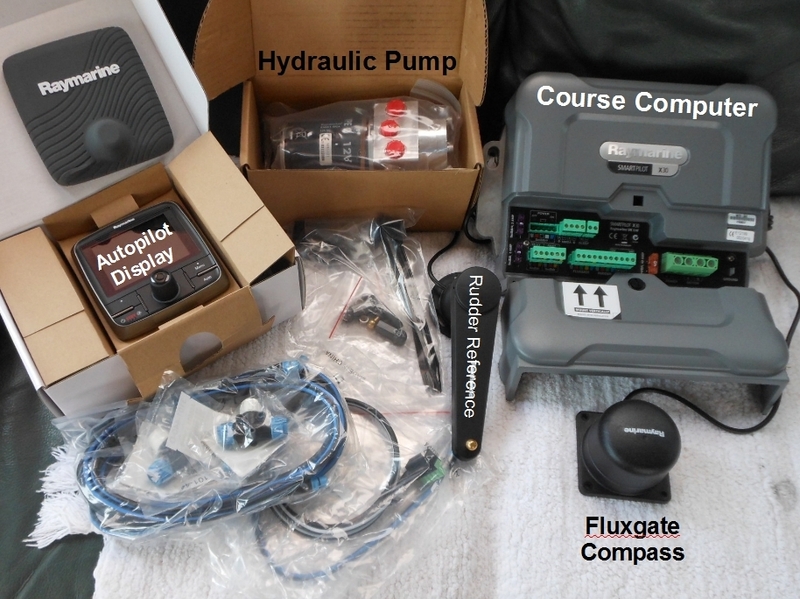 The auto pilot system uses fluxgate compass data and other algorithms to figure out where the rudder is pointed. But on larger, and slower vessels you will typically need a rudder reference for good auto pilot steering. It's also handy to be able to see the rudder orientation if you are trying to back the vessel down into a dock. Last but not least, the final basic element is the fluxgate compass. This is a couple coils of wire wrapped around a magnet that miraculously with the aid of some electronics tells you what direction you're headed, and does it quickly. In part two, we are going to rip out an older not repairable autopilot system, and replace it with the new one. 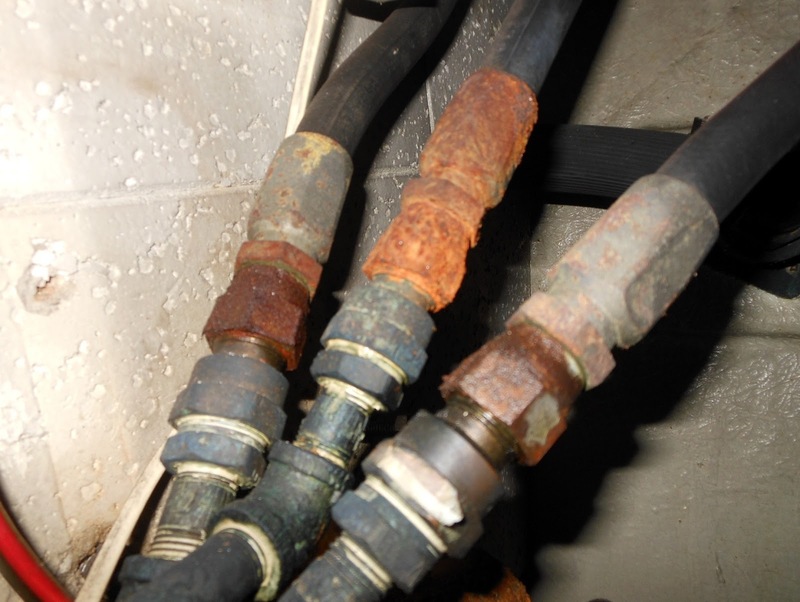 Along the way, we are going to sever plumbing and let the hydraulic system bleed out. We will deal with a variety of plumbing pieces, copper tubing, dragging wires throughout the boat and why things were put where they were. There will also be some judicious application of pejorative vocabulary along the way. When we're done, you should be able to this this yourself, unless you play the violin, or do open heart surgery, or just want to keep you hands scar free. As I have a Marol (a Japanese commercial) hydraulic steering system with two helms, and am looking to install a parallel autopilot setup, I look forward to this and to your suggestions. This is a great start. I have installed a couple Garmin GHP 10 and 12 systems. Fine tuning during a sea trial is the most critical at the end. Just completed a Garmin GHP10 autopilot for which Garmin does not offer a rudder reference sensor. I installed a Simrad RF25 on the N2K network and now the Garmin reads it backwards. Turn the wheel right and Garmin thinks the helm is turning left. Has anybody had success with this? What make and model did you use? Any suggestions? Did you resolve the Rf25 to GHP10 installation? 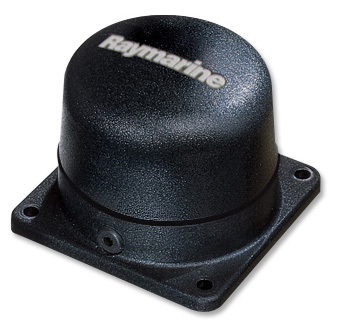 Were there any adaptors needed for the N2k between the Simrad sensor and the Garmin network? I am considering installing this. Hi Keith, there isn't really a good answer. The GHP 10 was never configured for a rudder reference. Later models were, and can use the GRF10 rudder feed back. If you add a GRF10 to a Reactor the course computer uses that in place of the virtual rudder feed back software. This is not a N2K device. I think if you add the RF25 it will be seen by the Garmin system as N2K data that can be displayed on a MFD but will have no impact on the autopilot function. You most likely won't be able to configure it so you have a 50/50 chance of doing it right the first time, or flipping it around for the second try. There is also the option of adding the GRA10 analog adapter to do the same thing. 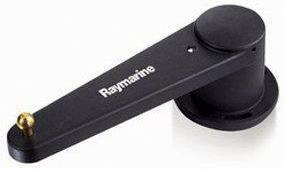 In other words you could use for example the Raymarine rudder reference and interface it to the GRA10 adapter and see the angle/position on the display. Sorry, no great answers. Move the rudder reference to "the other side" of the actuator arm. If no room for that, then turn it upside down. Same same. The direction will now be correct. Unfortunately Garmin doesn't have a rudder reference for the GHP 10 series. The GHP 12 does have an input that will use a variety of other manufacturers rudder references. The Simrad AP will have software that reverses the direction on the RF25 unit. My only thought is to reverse the base of the unit 180 degrees using a piece of wood or starboard cantilevered off of the rudder table. I do think Garmin should have a rudder reference for their pilots available. You could always revert to a analog gauge style unit for the helm. Is there a part 2 (3,4) hiding somewhere? BTW, very interesting and well written bog. Wondering the same thing. Where is part 2 (3,4)?